I get a lot of questions about my backpack: Why do you carry a backpack instead of a purse? Is it some kind of mom thing? Is it a business-related thing? Honestly, it’s a little of both. I carried a purse for years, then I had kids and I started carrying a diaper bag. Then the years went on and I needed something that was a combination of the two. So I call this my Working Mom Backpack. It’s durable and dependable. It keeps my hands free, and it holds all my stuff. Yes, it has my work essentials but it’s also filled with all the things that put some pep in my step. I drink water all day long because I feel more energetic when I’m well-hydrated. As a busy mom, I need all the energy I can get! To keep things exciting I slice up lemons, oranges, cucumber, strawberry, or apples to add to my water (I switch it up every week). Bonus: By using a refillable bottle rather than buying plastic ones, I’m helping the environment. I’m always listening to music, whether I’m at the office or the gym, so headphones are a must. They also come in handy when my youngest son, 4-year-old Ford, and I are at sports practice for the older boys. I let him watch videos on my phone so he stays busy while I concentrate on what’s happening on the field! I keep various flavors of sugar-free gum in my bag so I can pop some in and start blowing bubbles when I’m feeling sluggish. For whatever reason, this gives me a boost of energy. It’s also a little sweet treat that keeps me from turning to cookies or candy when the afternoon slump hits. My kids love gum, too, so it’s a great way to give them something sweet that won’t cause a sugar rush! 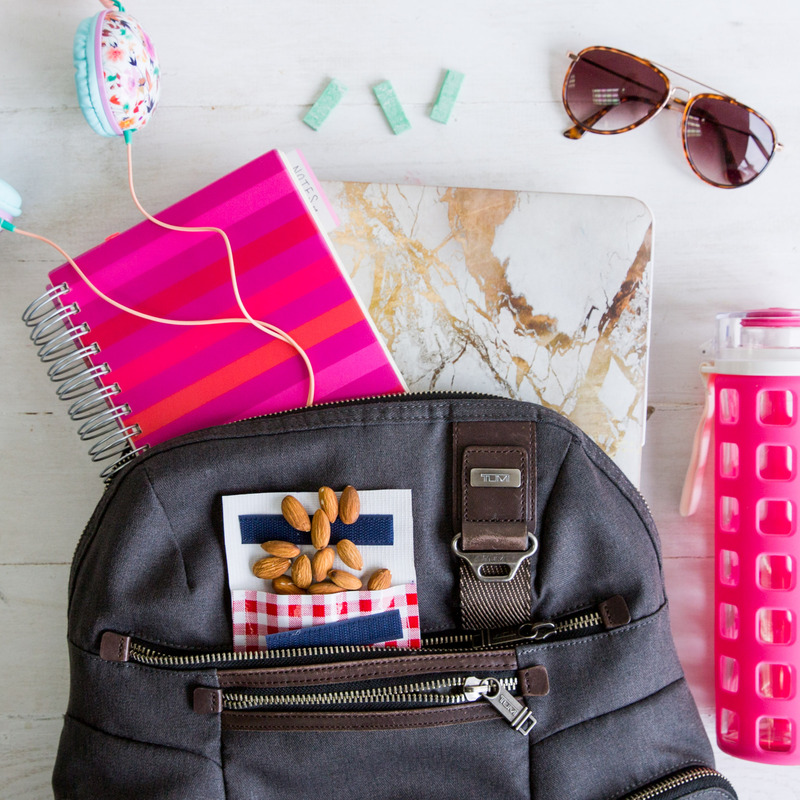 I always make sure I have high-protein snacks in my bag to keep my blood sugar from crashing. Almonds are my go-to. Cause with three young boys I always have to be on. Everything I do for work revolves around my laptop, so it’s always with me wherever I go. Because I carry a backpack, there’s plenty of room for my computer—and everything else I need. My fave accessory on the planet. Not only do sunglasses protect your eyes but they also look cute with every outfit. No time for mascara before school drop-off? I just pop on my sunnies and I instantly look put together. I’ve used digital planners and fancy date books, but my tried-and- true method for staying organized is a large spiral bound notebook. I use it for my grocery list, at-home and work to-do lists, the boys’ schedules — it’s all in there. Every morning I open up my planner to the next page, date it, and start my list. Sometimes the simplest solution for getting it together is the best!